You know him for his equation. You know him for the shaggy Afro he wears in the black and white photos that are usually used to reference him. You might even know him for being the guy who married his cousin – she was related to him both maternally and paternally. That kind of intermarriage also happens a lot in the Bible and in the royal family so I’m not judging. 1. 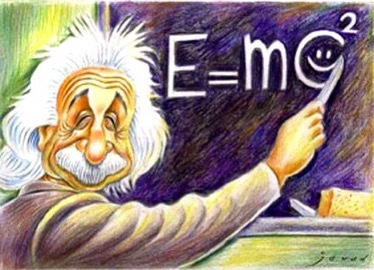 Einstein was a brilliant scientist who dedicated much of his day to studying his environment and then writing about it. I can do that. 2. 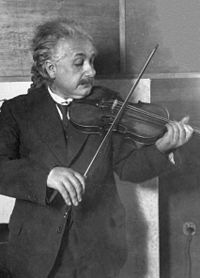 Einstein was a self-taught violinist and practiced everyday. He was also known to carry his instrument everywhere. I have a violin which I should probably learn to play well so I can start carrying it everywhere (I am vaguely aware that the two things are interrelated – consistent practice and improved performance). 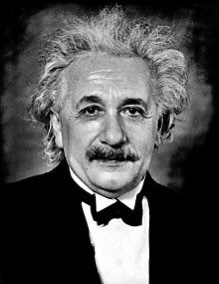 Furthermore, Einstein said if he wasn’t a physicist, he’d be a musician, saying that he often thought and daydreamed in music. I’ve done that. 3. Einstein had a book club. To be fair, they probably started off as a group of science enthusiasts wanting to bounce ideas off each other, but the group that called themselves the Olympia Academy, also read and discussed books. I read a lot and have been writing about books for a while but I just started chatting about books on my YouTube channel and it’s kinda feeling like a book club to me. So there. 4. Einstein was passionate about social justice and often spoke up about causes, even those that didn’t necessarily affect him. In a speech he gave about racism, he said, “I do not intend to be quiet about it.” The world needs more people who aren’t content to be passive about issues. 5. On his first visit to America in 1921, Einstein was so impressed with the people, he wrote an essay about Americans, calling them joyful and full of life. It would be 12 years before he moved here and a big reason for the move was his anti-war beliefs. But I believe he never stopped loving this country. I’m an immigrant too. On my first visit to the NYC umpteen years ago, I knew I wanted to live in this city and here I am, all these years later, still loving this country, impressed with the people I’ve met and writing about my experiences here. Who’s your role model today? What similarities do you have with them?